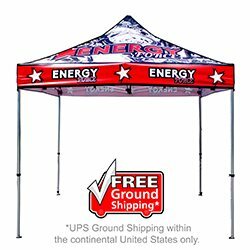 Custom Printed and Branded Event Tents and Canopies. Drive Your Customers, Announce Your Brand and Be Heard! Whether indoors or out, custom printed tents and canopies provide a great branding opportunity! This business-to-business Professional shelter is in a class all of its own with solid construction, heavy-duty framework, professional grade materials and key design features. This product is a dream for professionals wanting to boost business branding or corporate appearance at events and tradeshows.